Someone asked: "Have you ever encountered a problem where your playlist that is made up of a podcast stops playing songs one after another, and instead plays one and stops? This has happened to me on two separate machines where I download KCRW's Top Tune, create a playlist, and iTunes will not play the entire list. It's very puzzling." 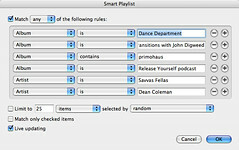 I think the key is to use a "smart" playlist. See picture.